Like many of you, we at AFSC have spent much of the past two weeks grappling with the results of the election and what they mean for communities across the U.S.We don’t know what the next administration will bring, but there’s no doubt that immigrants and refugees face greater danger because of this election. We must affirm our deeply held beliefs, rooted in Quaker values, that all people have a right to migrate as well as a right to stay in their home country safely and securely. Now more than ever we must continue to speak out against anti-immigrant and other xenophobic rhetoric, stand up against immigrant detention and deportation, and call for policies that respect the humanity and dignity of all people. Since the election, the U.S. has seen a rise in incidents of xenophobic and racist harassment. The president-elect has said he would revoke immigration benefits that were issued by President Obama, fulfill his campaign promise to build a wall along the U.S.-Mexico border, and punish cities that refuse to cooperate with his harsh immigration enforcement policies. These changes would devastate all of our communities. To effectively push back, we must take our lead from those who will be most impacted by the terrifying policies that Trump has proposed—immigrants themselves. Across the country, we’ve seen success where movements do just that. Immigrant communities have been the targets of mass detention and deportation for decades. 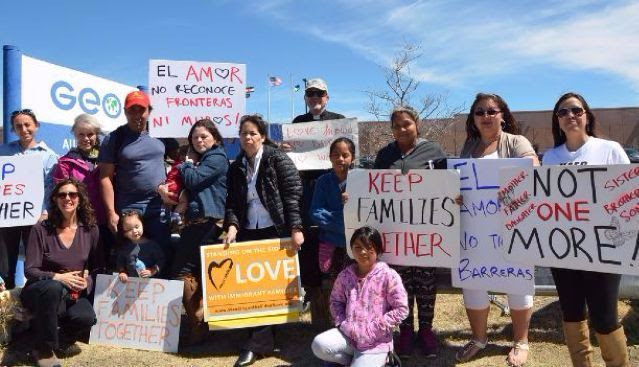 These policies have taken a tremendous toll on immigrants, their families, and our communities, but have also had the unintended consequence of creating communities that are mobilized and resilient. We at AFSC are committed to continue our work with and among these communities, as we have for decades, providing direct support and pushing for policy change at the federal, state, and local levels. Today, with the stakes higher than ever, we hope you will continue to stand with us. Expect to hear more from us on ways to take action during this new administration, but here’s something you can do right now: Help us change the narrative around immigration. Here are some resources on how to have these difficult conversations about immigration with people on Facebook and when talking to your friends and loved ones this holiday season. This election demonstrated the extent to which immigrants are scapegoated for our country’s social and economic problems—and what happens when politicians take advantage of that. We have the power to challenge those harmful narratives. Use these tips to help you respond to common anti-immigrant arguments. These conversations can be hard, but they are necessary to build the inclusive country that we all deserve.